These little guys sit on my desk at work. They make me smile, and they annoy my boss (apparently it makes my desk messy!). The best bit of all about these 'lucky' cats though is the Amazon review I read which persuaded me to buy them (I needed a lot of persuading as you can imagine!). My Story - By S. Altaf on 4 Feb. 2014Verified PurchaseI originally bought these as I was looking for some minor, unobtrusive decor that I could place on my office desk; nobody would really notice it and as I was pondering problems, I would pick it up and play with them in my hands (they are tiny). That's what I told myself. The real reason was that and I could do with a bit of luck in my life. The description mentioned that it was white for health, pink for love and black for protection. Just what I needed. Soon after buying these, I started to feel a cold coming on so I began carrying the white one in my pocket wherever I went. I put it in my shirt pocket on my morning train commutes, as London trains are places where sicknesses are exacerbated. Surely this would keep me hale and healthy! But no, it made no difference. As was typical, traveling in the tubes made my cold worse and I had to stay at home for a few days, missing important work deadlines. Even during the worst of it, I would take the little cat out and bring it near my mouth whenever I coughed or sneezed - thinking it would somehow stop - but nothing happened. Thinking the white one defective, I put it away with the thought that I would return it later; it was time to test the pink one. There was a co-worker with whom I had become friendly recently and was hoping to ask out on a date. I began carrying the pink cat in my shirt pocket, and as we were making afternoon coffee one day I began asking the question as I reached for the spoons which were on a low shelf. I was only a few words into the sentence at this point when the pink cat fell right out onto the carpet. I stopped and we both stared at it. I in horror at any judgment that may be cast upon me for carrying it, and her in surprise. But this surprise turned into a delighted squeal as she quickly reached down and snatched it up. She was smiling from ear to ear and it seemed to have quite an effect upon her, she found it very cute and adorable. But before I could even continue asking her out, she had run off back to her desk. Over the next few days, her attitude towards me had completely changed. She had the pink cat on her desk - my pink cat - and would give me an icy stare of death whenever I walked past or simply ignore me. But I would often catch her wistfully smiling and playing with the pink cat - my pink cat - quite often throughout the day. It was a lost cause, and at this point I didn't think I'd be able to get any kind of refund back; I let the pink cat go and moved on to the final one. The black cat, for protection. To avoid any other mishaps, I started carrying the black cat in my back pocket. There was no chance this would fall out now. A fateful day arrived - as I was walking home one night, a group of thugs surrounded me. They demanded my wallet and phone (promising to return the SIM, these were civilized thugs after all). Knowing that I had the black cat for protection, I refused. One of the thugs got angry at this and pushed me quite hard. As I stumbled back, my foot got caught on the curb and I twisted as I fell. I ended up falling hard on my stomach and face. The thugs laughed and searched my pockets, taking my wallet and phone. They found the black cat but put it back where it was. Some protection that was! So that was it - I was very angry and had decided to complain to the sellers about the spate of bad luck that these things had brought me. I would demand a refund even if the pink cat was not part of the returned packaging! As with all major decisions, I decided to sleep on it before ranting at them in the morning. The very next day, when I woke up, a realization hit me. You see, these cats were exactly what they said they were in the title - *they* were the lucky cats. The white cat hadn't fallen sick - it was lucky in health. The pink cat had been taken by my co-worker - it was lucky in love. The black cat was protected by my fall - it was lucky in protection. 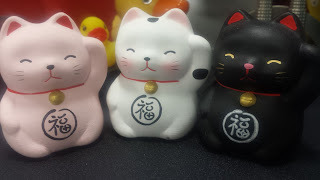 It wasn't that these things would bring me luck, they were exactly what they said they were - these were lucky cat kittens. Only a fool would think that inanimate objects can bring luck to them, the universe doesn't work that way. My mind had been opened and freed at last. The epiphany was enough for this product to earn a 5 star rating from me. I happily went back to reading my horoscopes for the day to see what else fate had in store for me. I guarantee this will make you smile, even if you don't end up buying three small lucky cats!